Interested in learning more about Everything DiSC? View a personal demonstration from the comfort of your home or office. We will present a customized 30-60 minute demo just for you. Attend the session alone or bring your entire team! Learn how to implement Everything DiSC from experts with years of experience. See samples, explore the facilitator kit and watch situational videos. 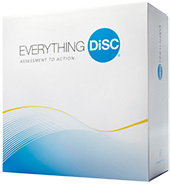 It's the perfect way to learn about the Everything DiSC training programs and all of the options available to you. To request your free demonstration, submit the form below. Use the notes section to let us know which product interests you the most. If you have questions about the webinar or about Everything DiSC, please contact us using our contact page or by phone 1-888-658-6641. One of our representatives will gladly answer all of your questions. Please check the box or enter the text displayed in the image below prior to clicking the submit button. "Everything DiSC", "Everything DiSC Workplace", "Everything DiSC Work of Leaders", and "Everything DiSC 363" are registered trademarks of John Wiley & Sons, Inc.